I came across this on Pinterest and immediately thought of you, so I thought I would share! I'm going to have to borrow this one -- I like it a lot. I like the punctuation marks one best. I read. I chuckled. I liked. 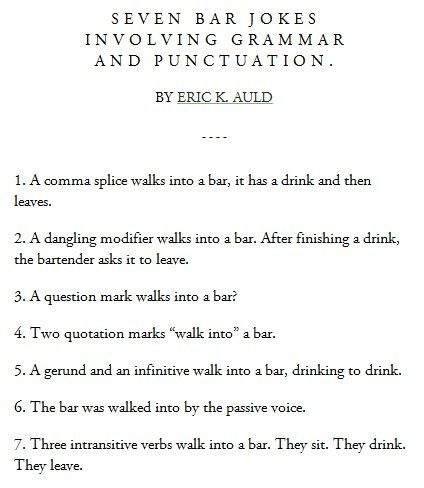 The ones about comma splices and quotation marks made me laugh, I liked them "a lot." I make a mark on students sometimes—usually, it's like an ugly tattoo inked after a night of drinking cheap tequila. Here at If the Six, we aim to please. Number seven is my favorite. Every time I turn around, you're receiving another writing/reporting award, Sam, and it seems the work you're being cited for is solid, substantial and often troubling/troublesome stories. Good for you for not flinching.